People often ask me how I became a press photographer, so this is my story. When I left my local grammar school I was considered a bit of a failure. I was 18 years old with a couple of A-levels that were no real use to anyone and I had no idea what I wanted to do with my life. I was not going to Oxford, Cambridge or some other University like most of my former classmates. 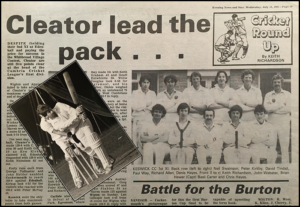 I loved sport and I lived for the summer months when I could represent my town in the local cricket team. I was never good enough to make a living from sport, but that was the highlight of my week and not much else mattered. As the new school year approached I made a last minute gesture and secured a place on an Industrial Design Engineering course at Teesside Poly, exchanging the beautiful Lake District for ‘smog city’ otherwise known as Middlesbrough. Teesside Poly must have been even more desperate than me because they let someone who cannot draw onto a design course ! I stuck with the course for a couple of terms during which time I had to buy a camera. A student friend called Dave Newell taught me how to process film and print in black and white. I was now hooked on photography, industrial design was never going to work for me so I quit. I returned to Lake District in time for the cricket season and starting taking my camera along to our games. 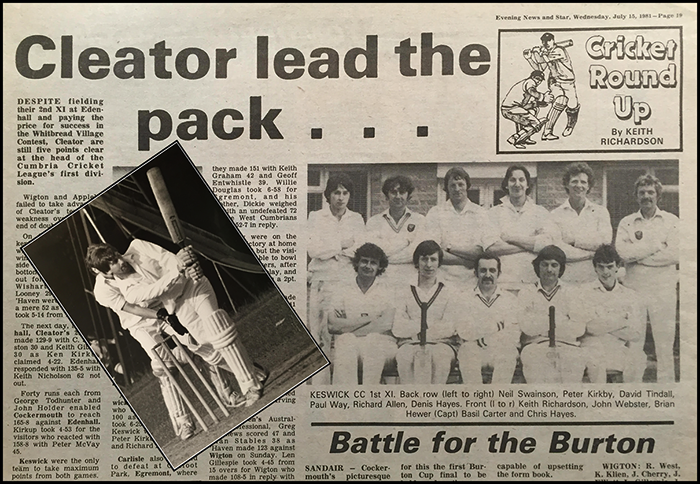 One of my team mates, Keith Richardson, wrote the cricket reports for our local paper. He suggested I let him have a picture of the opposition team each week and he used it alongside his article. Teams looked forward to playing Keswick because they got their pictures in the paper. These were my first published pictures and this very basic ‘portfolio’ helped me obtain a place on the NCTJ press photography course in Sheffield. The wonderful game of cricket has been a major influence on my life and I wonder where I would be had I not started playing. Over the years I have photographed many test matches, my highlight being the World Cup Final in 1992 when England lost to Pakistan. I had been with the England team in New Zealand and had some fabulous times in the company of the players. This years I covered the most incredible Ashes Test at my local Trent Bridge ground, with Australia bowled out for only 60 on the first day (see pics). It was brilliant to photograph another former Cumbrian, Ben Stokes, star alongside Joe Root and Stuart Broad. I have been very lucky and doors have opened at the most surprising times. People like Dave, Keith and many more were a great help along the way. Education may seem like the most important thing at times but meeting wonderful people certainly helped me along the way. I had a challenging assignment last week at the home of the legendary Nottingham outlaw Robin Hood. Deep in the not so greenwood of a Sherwood Forest winter stands the iconic Major Oak. My idea was to ‘paint’ the tree with red light to add some drama and promote the ongoing European Tree of the Year campaign. The shots were taken at dusk and I used several Nikon speedlights to illuminate the tree controlled by Pocket Wizard radio slaves. I do admit photographing an English oak tree at it’s best in February is not ideal, but a press photographer has to adapt to the situation. Even the famous outlaw Robin Hood (Ade Andrews) and Maid Marion (Sylvia Robson) joined me to back England’s campaign to crown the Major Oak as the 2015 European Tree of the Year. The competition is a bit like the tree version of football’s champions league. Major Oak had to win the English tree of the year title last year to qualify. With an online public vote taking place throughout February, sweethearts Robin and Marian have teamed up with Nottinghamshire County Council and the Woodland Trust to back the Major Oak in the bid for European glory. The tree weighs an estimated 23 tons, has a girth of 33 feet (10 metres), and is about 800–1000 years old. It can be visited in the heart of Sherwood Forest Country Park near Edwinstowe. The visitor centre is about 20 miles north of Nottingham and the area is part of Sherwood Forest National Nature Reserve. Because of the oak’s national importance, conservation measures have been carried out since 1908. Initially metal chains were used to support its weighty branches and lead sheet attached to protect the trunk. These were replaced in the late 1970’s by large wooden struts. Today, slender steel poles prop the sprawling limbs of this forest giant. Tree surgeons check the oak periodically and carry out remedial work as required. According to folklore its hollow trunk was used as a hideout by Robin Hood’s merry men. But if Robin was active in the 12th or 13th century, as legend suggests, this tree would only have been a sapling. So it must have been another, much older oak that hid the outlaw. It a still a great story and why should a few facts spoil things. I also produced an interactive 360 degree view of the location to let you join us at the site. To see the 360 degree panorama of this fabulous tree click on the image below then use your mouse to adjust your view. To vote in the Environmental Partnership Organisation contest click here before 28 February.